On Wednesday, the Democratic Alliance party leader Mmusi Maimane held a press briefing in Cape Town regarding the approaching Day Zero for the city. He briefed media and city representatives about a plan the party had developed to prevent the taps from running dry in Cape Town. The Daily Vox team rounds up. Amidst the looming disaster in Cape Town, the DA political structures in the city seem to be in crisis mode with Mayor Patricia de Lilleâ€™s management role as the head of the crisis being curtailed, Helen Zille, premier of the Western Cape, taking control over the disaster management of the crisis, and now in the latest political move, Mmusi Maimane announcing that he will leading the plan to try and prevent Cape Town from reaching Day Zero. In his press briefing where the partyâ€™s Defeat Day Zero campaign was launched, Maimane laid out the plan to ensure that the City of Cape Town does not reach Day Zero. Part of the plan includes the appointment of various DA officials to different portfolios. Ian Neilson, the deputy mayor for Cape Town along with Xanthea Limberg would be taking the lead on a Drought Crisis team and would be directing efforts to defeat Day Zero. Helen Zille as the premier would be in charge of disaster management while Bonginkosi Madikizela, head of the DA in the Western Cape and Anton Bredell would be in charge of strategy for the team. BREAKING: This is the #DefeatDayZero team. The DA leader acknowledged that his move to take hold of the government was an unusual response but that it came about because he was not happy with how the city had handled the crisis and the communication surrounding it. Maimane said the team has assembled would be holding weekly press briefing to ensure there was communication with people about the progress being made. The DAâ€™s leaderâ€™s speech was interrupted by hecklers from the crowd asking why he (Maimane) was lying, but they were quieted down by Phumzile van Damme, national spokesperson for the party. Maimane was then allowed to continue. The DAâ€™s plan to avoid defeat Day Zero as outlined by Maimane includes the medium to long-term goals of augmentation of the water supply through desalination, even though Maimane said that City did not have the kind of money needed to fund those type of projects. They would also be using aquifers and private dams to get water. According to Maimane, these projects would yield 120 megalitres of water by May 2018. The shorter goal that Maimane presented for ensuring the City does not reach Day Zero was for demand to go down and for consumers to save water. He said punitive measures would be implemented to ensure that compliance with the restrictions. Helen Zille said whilst answering a question from media that while there would be not finger pointing in this crisis, but that she would be pointing out the constitutional responsibilities of the different government levels. She said that there were reports that the minister of water and sanitation Nomvula Mokonyane was coming to visit the city to oversee the provinceâ€™s disaster management efforts. However, Zille said that was not the mandate of the department and should instead be the mandate of the department of minister of cooperative governance and traditional affairs Des Van Rooyen to be in charge of disaster management. Zille had previously blamed the national government for the crisis, saying they had refused to build a dam which the city had called for. Maimane ended of his speech saying that if the City does reach Day Zero, the water at schools, hospitals and other essential services will be continue to be supplied. 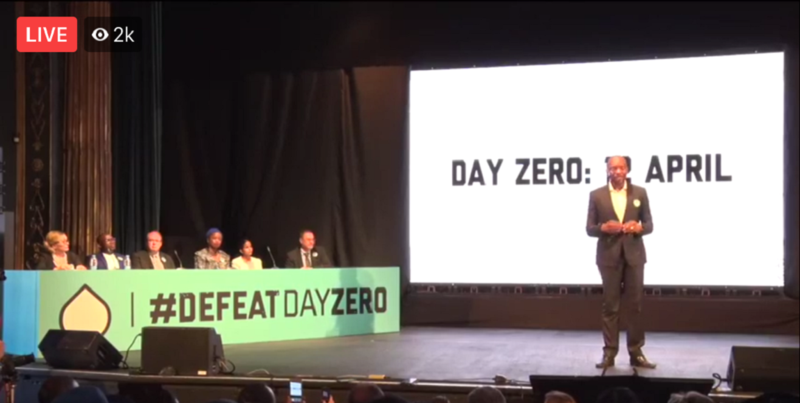 â€œWe can avoid this and defeat Day Zero.â€ said Maimane.